Davor Krmpotić, team leader of Velebit Mountains team, welcoming Konik horses arriving from Latvia to Lika plains rewilding site in Croatia. Velebit Mountains became part of Rewilding Europe’s rewilding area portfolio in 2011. Davor’s hometown is a medieval Croatian coastal town located at the foot of the Velebit Mountains. After finishing his studies at Zagreb University as a Forestry Engineer his connection with the Velebit mountains led him to return to Senj. Velebit is an area of unique natural beauty with a stunning array of habitats and a rich biodiversity. When he came across a job advertisement by Rewilding Europe describing a new, exciting project needing a qualified leader, Davor saw his opportunity to give back to the mountains. While Davor did not know what exactly would lie ahead of him if he took the job, he did know that it sounded like just the challenge he was after. 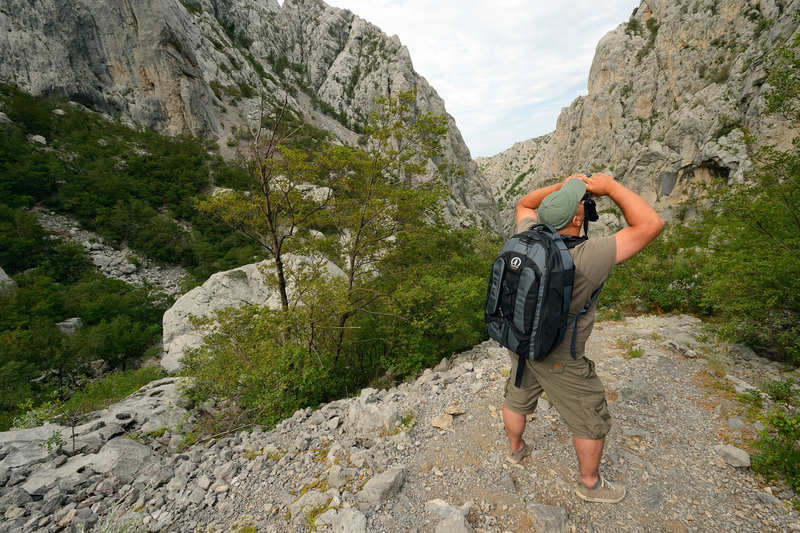 In many ways, the Velebit Mountains are a prime case study of rewilding in action. The abandonment of agricultural land and traditional rural practices is an issue that has affected the region for decades, dating back to policies under the old Yugoslavian government where many people from rural areas resettled to work in factories. This legacy has had a profound effect on the region and its people. Today, it is less densely populated than the Sahara desert and hill farmers are a dying breed. Those few farmers who have stayed behind are deeply connected to the land and committed to its future. They recognise rewilding as an opportunity to revitalise the region by supporting its iconic wildlife, including Balkan chamois, brown bear, wolf and lynx. Davor Krmpotić doing field work in Velebit Nature Park, Velebit Mountains rewilding area, Croatia. In addition to bringing more life and excitement to the mountains, this also opens the door for new business opportunities in ecotourism, as Davor is eager to point out. There is genuine enthusiasm in his voice when he mentions being able to see bears and swim with dolphins on the very same day, a wildlife experience one would be hard-pressed to find anywhere else in Europe. There are, of course, conflicts that need to be tackled wherever large wild animals enter the equation. Currently, Davor is simultaneously working to improve habitat conditions for brown bears and to reduce human-wildlife conflict at the same time. It is his mission to create a climate of understanding and peaceful coexistence for the people and wildlife that call the Velebit Mountains their home. Though the overall vision always remains the same, no two days in Davor’s working life are alike as new challenges and unexpected developments are always just around the corner. It is the exact opposite to the desk job Davor had been getting bored of in his pre-rewilding days, and he would not have it any other way.